Wow now that’s an action packed trailer, even funny at times. Hopefully anyone with doubts about this film will have their minds changed and it will make some money. Neill Blomkamp is an impressive film maker and has shown great promise so I don’t want to see his films fail at the box office. The only excuse is if it doesn’t get good reviews, otherwise I will be furious! On the other side of things we get beautiful visuals, great acting, interesting characters and some new insights into the plot of the film. Hope you enjoy the trailer and stills I managed to grab. Add your comments and likes at the end. In the year 2159 two classes of people exist: the very wealthy who live on a pristine man-made space station called Elysium, and the rest, who live on an overpopulated, ruined Earth. 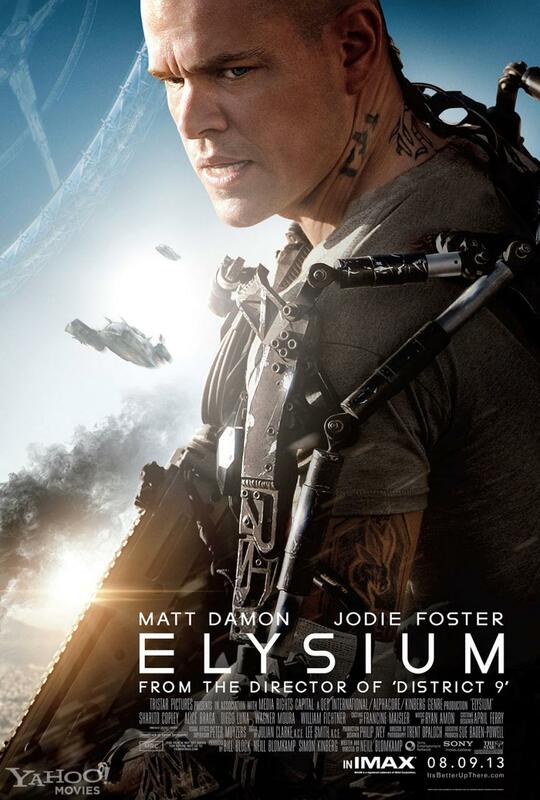 Secretary Rhodes, a government official, will stop at nothing to enforce anti-immigration laws and preserve the luxurious lifestyle of the citizens of Elysium. That doesn’t stop the people of Earth from trying to get in, by any means they can. When unlucky Max is backed into a corner, he agrees to take on a daunting mission that if successful will not only save his life, but could bring equality to these polarized worlds. I didn’t even know he was in this film. Sorry about the pic, I couldn’t quite get a clear still of him in this trailer but it is him. Encase you didn’t quite recognize him it’s the FBI guy from Prison Break. Finally we know why he has to go up there. Still don’t really know what else he is trying to do but at least we get his motivations, he starts to save his own life and will end up doing it for others. I think Neill Blomkamp likes to make unlikely heroes which I really liked in District 9. Here we see a new shot of Elysium which looks as impressive as ever, actually looks like a futuristic country club. Bet those people are snobs too, blow it Matt Damon! Other than being an extremely cool shot the scene does prove something, the strength and durability of that exoskeleton. Even with Kruger having super strength and what looks like a very sharp blade all he can muster is a few sparks and a dent. This should make for an epic battle. Not sure if Neill is new to space CGI but he is doing a splendid job. The look, the feel and even the physics look spot on so far, I particularly like this shot of a ship dodging a missile. Not sure if he is referencing something older but I remember a similar robot taxi driver in Total Recall (1990), I really hate having to put the year now damn remakes. Anyway it’s the funniest scene I’ve seen so far and I am glad there will be at least a little humour. I had to split this into two because it’s kind of hard to make out from just one. Here we see Kruger activating some kind of energy shield which just looks amazing, didn’t even know they had that tech, now where can I get that suit? In the second image we see the shield in full use as Matt Damon shoots frantically at Kruger. Interesting visual note here is how the bullet reacts to the shield, unlike most shields used in science fiction it doesn’t simple crumple it explodes on impact with the shield. But at this stage I don’t know if the shield causes that or the gun shoots explosive rounds, looks damn cool though. I just couldn’t get a good still of this so I made a GIF, sorry if you have epilepsy (to be fair you shouldn’t be watching this trailer either). A personal highlight of this trailer is seeing Neill Blomkamp creative futuristic guns create mayhem. The more I look at it the more I think this is two separate scenes but the purpose of this it looks mighty impressive. Activate Kruger, because he’s a killing MACHINE!!! I cannot wait to see this character in action, you can just tell he’s a psychopathic killer, and there are even shots where you can see him enjoying his destructive actions. Plus he has a sword, and the only person who uses a sword instead of a gun is a man who likes to watch his enemies die. Well that’s my views. Now what do you think about this newest trailer? wow. Some stuff I hadn’t noticed in this trailer. I totally missed William Fichtner’s spot in this. Good catch. those weapons and that shield…this looks chock-full of some sweet fight scenes. I haven’t been too interested in this to this point, but your spotlight gives me more to look forward to here. Thanks Tim. Nice work. Most Awaited….lol I can’t type. What did you think of the robots? I can’t get over how real they look. Blomkamp is a pro at CGI. Looks good right? Favorite bit? I think I love it because of the overall feel to it. The trailer intrigues me to the point of my anticipation peaking as much for a big summer movie, but this one really looks like it’ll payoff. So. Much. Awesome. 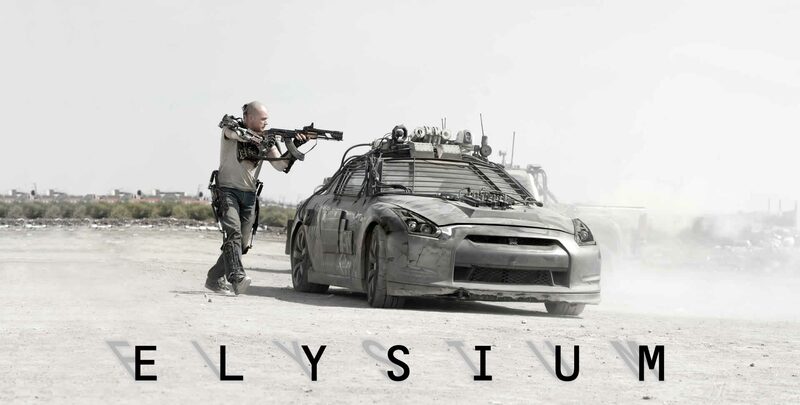 After a summer of duds, Elysium will brilliantly take us into Fall.